Character information for Cait Sith, aprotagonist of Final Fantasy VII. Includedare his background, stats, and limit breaks. 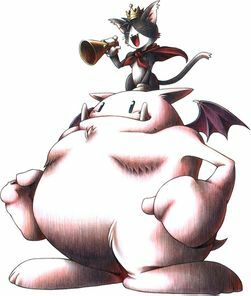 Cait Sith is an anthropomorphic, remote-controlled, plush toy cat standing just over three feet tall with short black fur and a white stomach. He rides around on the back of a huge stuffed Mog he magically brought to life. He has a Megaphone, in which he’s always shouting orders and creating dopey attacks. His hobby is fortune telling, but just like his personality, his skills in fortune telling are pretty unreliable. In the previous Final Fantasy titles, the white mage job was for characters with high magical attributes, and low strength and health points. Cait Sith corresponds well with this job. His Limit Breaks also correspond with the white mage trend, as well. Cait Sith is the only character with 2 limits instead of 7, so he can focus on healing, support, and debuff abilities instead.